Of all the Warsaw Pact armed forces, the East Germans were relatively the most well equipped and well trained behind the Soviet Union. They were essentially an extension of Soviet force in the West and were expected to penetrate deep into Western Europe alongside their Soviet counterparts seizing key cities such as the West German capital of Bonn and overwhelm and defeat NATO forces. With 180,000 ground troops assigned to one of eight motorized infantry divisions or one of two armored divisions, East Germany maintained a large force for preparing for confrontation with the West. 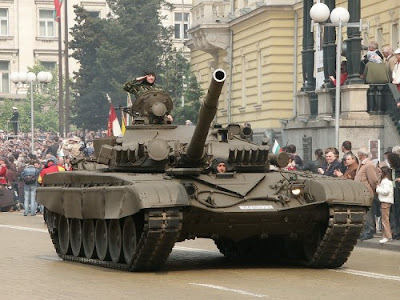 It was outfitted with a large number of modern weapons systems, most of which was of Soviet origin, from which a small portion was returned to the Soviet Union in 1990. After reunification, the remaining equipment and materials was very substantial. Large quantities of replacement parts, medical supplies, atomic, biological and chemical warfare equipment, training devices and simulators, etc. had to be disposed of. One of the first measures taken after reunification was a survey and securing of weapons and devices by former members of the NVA. The federally operated Material Depot Service Gesellschaft (MDSG) was charged with taking custody of and warehousing this equipment. The MDSG employed 1,820 people who were primarily taken from the Bundeswehr. The MDSG was privatised in 1994. Unless the defense material was given free of charge to beneficiaries in the new federal states or other departments, to museums, or to friendly nations in the context of aid supplies in third world nations, it was destroyed. When the Iron Curtain collapsed in 1990, and Germany was reunified, the Landstreitkräfte was shown to have in it's inventory a force of 2,761 tanks and armored personnel carriers, 133,900 wheeled vehicles and 2,199 artillery pieces. The might of the East German Landstreitkräfte was centered mainly around it's extensive armored corps. 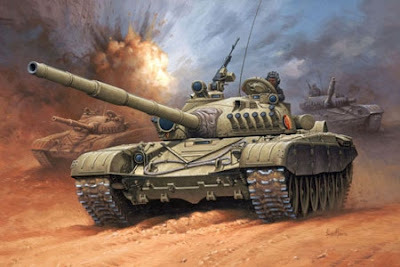 Operating some of the latest Soviet main battle tanks at the time most notably the T-72 main battle tank and the BMP-2 armored personnel carrier, the Panzertruppen (Armored Troops) of East Germany were a formidable foe. The Fulda Gap was one of two obvious routes for a hypothetical Soviet tank attack upon West Germany from Eastern Europe, especially East Germany; the second route was the North German Plain, and the third, less likely, route was up through the Danube River valley in Austria. The concept of a major tank battle along the Fulda Gap was a predominant element of NATO war planning during the Cold War, and weapons such as the AH-64 Apache attack helicopter and A-10 ground attack aircraft were developed with such an eventuality in mind. The Soviet plan for winning a conventional war quickly to preclude the possibility of a nuclear response by NATO and the United States was based on the deep-strike concept Soviet military theoreticians first proposed in the 1930s. After 1972 the Soviet Army put deep strike into practice in annual joint Warsaw Pact exercises, including "Brotherhood-in-Arms," "Union," "Friendship," "West," and "Shield." Deep strike would carry an attack behind the front lines of battle, far into NATO's rear areas. The Soviet Union would launch simultaneous missile and air strikes against vital NATO installations to disrupt or destroy the Western alliance's early warning surveillance systems, command and communications network, and nuclear delivery systems. Following this initial strike, the modern-day successor of the World War II-era Soviet mobile group formations, generated out of the Soviet Ground Forces in Eastern Europe, would break through and encircle NATO's prepared defenses in order to isolate its forward forces from reinforcement. Consisting of two or more tank and motorized rifle divisions, army-level mobile groups would also overrun important NATO objectives behind the front lines to facilitate the advance of Soviet follow-on forces, which would cross Non Soviet Warsaw Pact territory from the westernmost Soviet military districts. The Warsaw Pact countries provide forward bases, staging areas, and interior lines of communication for the Soviet Union against NATO. Peacetime access to East European territory under the Warsaw Pact framework has enabled the Soviet military to pre- position troops, equipment, and supplies and to make reinforcement plans for wartime. In the 1970s, the Soviet Union increased road and rail capacity and built new airfields and pipelines in Eastern Europe. However, a quick Soviet victory through deep strike could be complicated by the fact that the attacking forces would have to achieve almost total surprise. Past Soviet mobilizations for relatively small actions in Czechoslovakia, Afghanistan, and Poland took an average of ninety days, while United States satellites observed the entire process. Moreover, the advance notification of large-scale troop movements, required under agreements made at the CSCE, would also complicate the concealment of mobilization. Yet the Soviet Union could disguise its offensive deployments against NATO as semi annual troop rotations in the Group of Soviet Forces Germany, field exercises, or preparations for intervention against an ally. The uniform displayed here is of an Oberfeldwebel (Senior Sergeant) of the East German Landstreitkräfte. The pink waffenfarbe denotes that the non commissioned officer was a member of the East German Panzertruppen (Armored Troops). Note it is of the black or closed collar type of uniform most notable of some 1970's era uniforms. It is made of the typical gabardine material of all National Volksarmee uniform. The visor cap shown here for a non commissioned officer in the Landstreitkräfte. It retains the stone grey color of National Volksarmee uniforms along with its associated white piping of the East German Ground Forces. The national hammer and compass metal insignia remains present in the center of the hat with the black plastic capband of enlisted men's visors around the base of the visor. This visor example shown here carries a letter "'T'" designation meaning the visor was manufactured in 1985. The size of this example is 55cm or 6 7/8in by American sizing equivalents. Shown here is the Kragenspiegeln (Collar Insignia) of NVA non commissioned officers. It is essentially, the same as all East German military collar tabs for non commissioned officers however it has the pink backing of the Panzertruppen (Armored Forces). Note the arrangement of the Kragenspiegeln against the black high closed collar and the associated silver tresses along the edge of the tunic collar signifiying the wearer's status as being a member of the senior non commissioned officer cadre. Shown here is a close up of the shoulderboard insignia for an Oberfeldwebel in the Landstreitkräfte with the silver tress of a Senior Non Commissioned Officer around the border of the board along with the two silver pips of an Oberfeldwebel. The pink base of the shoulderboard is representative of the armored troops. The pink color being associated with Armored troops since the days of it's inception for armored forces during the Third Reich. An Oberfeldwebel is essentially the equivalent of a Sergeant First Class in American Army equivalents or a Colour Sergeant in the British Army. Here is a close up of a set of East German service chevron stripes on the right sleeve of the tunic. The East German armed forces and police both wore chevrons on their uniforms but for different purposes. In armed forces service, enlisted and NCO ranks wore them to show the level of their professional commitment: 10 years maximum versus 25 years minimum. Police agencies used them to show years of service, with 5 years service time as the minimum. In appearance and construction, however, the chevrons worn by the armed forces and police were basically the same, differing only in width and unit colors. They consisted of silver or gold metallic tress, sewn on a fabric base with high wool content. Air and land defense units of the East German armed forces, including Border Guard and Civil Defense, used chevrons to distinguish between the 2 levels of professional commitment available to enlisted and NCO ranks. Soldat und Unteroffizier auf Zeit (Limited Time Soldiers) wore a single chevron. These soldiers pledged themselves to serve 10 years in the armed forces, where they are considered limited time rather than career soldiers. Berufsunteroffizier (Career Soldiers) wore two chevrons. These soldiers pledged to serve a minimum of 25 years in the East German armed forces, giving them the status of a career (or professional) soldier. The twin chevrons shown here indicate that the soldier was a Berufsunteroffizier. A pair of parade cuff bars sewn against the lower cuffs of the uniform tunic. Cuff bars were worn on both sleeves of the closed collar uniforms. They too retain the pink color of armored troops. Displayed here are the Landstreitkräfte Panzer Klassifizierungsabzeichen (Classification Badge) in it's three grades for Armored troops with a tank against a yellow background in gold, surrounded by a pair of oak leaves and the East German coat of arms with a hammer and compass at the top and the number of class of the badge and essentially wings protruding from the ends of the central round. It would be worn on the right side of the uniform over the right breast pocket of the tunic. 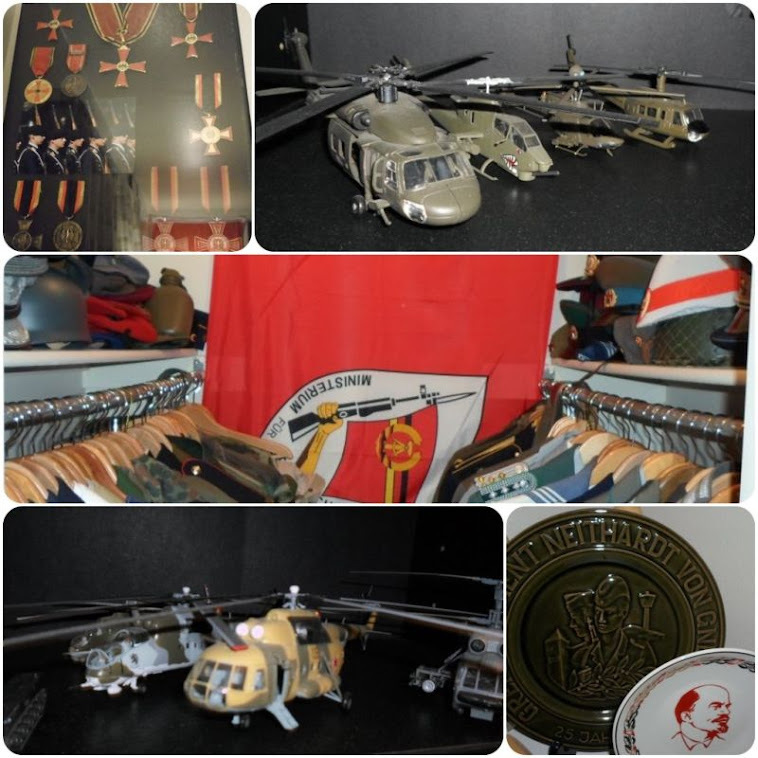 As with for many other services, the East German SED communist party issued many commemorative items and memorabilia in honor of service to the GDR state. Service to the armed forces was essentially a focus of repeated commemoration under the regime. many banners and wimpels (pennants) were created to commemorate the formation of NVA units. An example shown here is for the 9. Panzerdivision (9th Armored Division) stationed out of Eggesin. The banner celebrates the 20th anniversary of the armored unit and displays a tank of the Landstreitkräfte alongside the National coat of arms and the issuing agency 'National Volksarmee' across the top. Across the bottom of the banner is the words '20 Jahre' (Twenty Years), 9. Panzerdivision (9th Armored Division) with the dates of the anniversary 1956, essentially the founding of the armed forces to 1976. Along the bottom is a pair of oak leaves and an East German flag. The back of all East German pennants bore the national coat of arms of the armed forces with the hammer and compass insignia surrounded by the armed forces motto and a wreath of grain around it. Transmission: Synchromesh, hydraulically assisted, with 7 forward and 1 reverse gears.